PONY Baseball/Softball, Inc., began with organization of the Pony League in Washington, PA in the summer of 1951. This was a transition league for 13-year-old and 14-year-old players designed to take graduates of Little League baseball from that diamond to the regulation size diamond. Growth of Pony League, primarily by word of mouth, was rapid, and by the end of the second season, 1952, the original six teams in Washington were joined by 505 others in 106 leagues around the country. 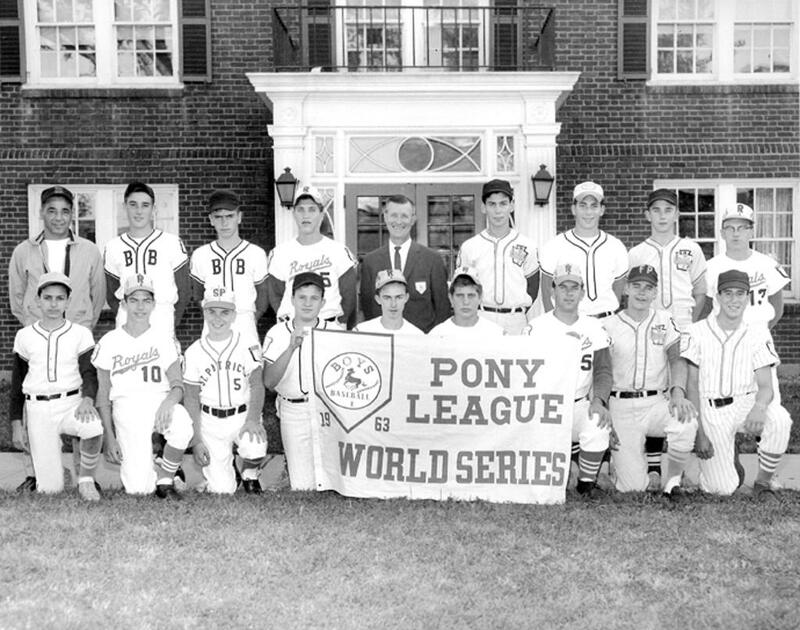 A national tournament was conducted, and the first Pony League World Series was held that year. PONY is taken from the first letters of each word in the slogan, “Protect Our Nation’s Youth.” More than 500,000 players participate in the PONY organization annually. WEST SEATTLE PEE WEE BASEBALL ASSOCIATION, INC. 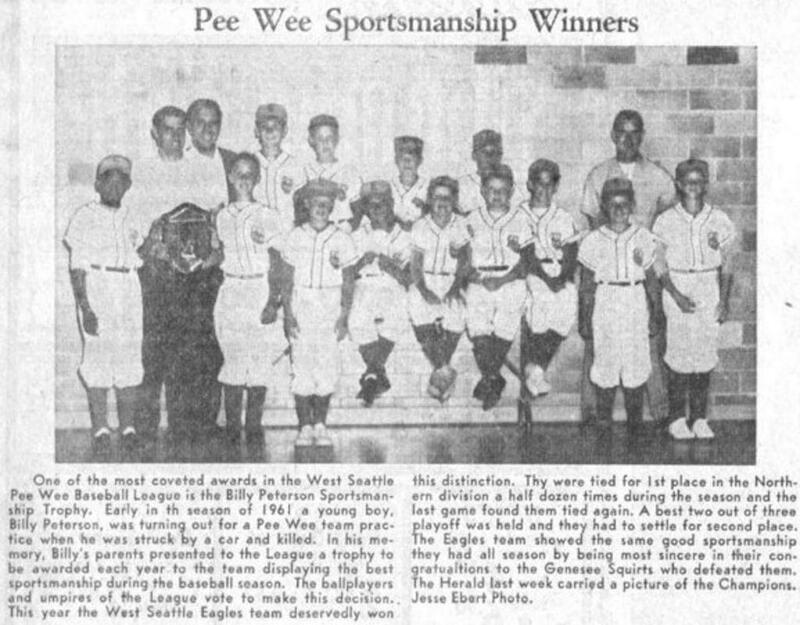 The West Seattle Pee Wee Baseball Association was founded in 1957 with 4 teams (sixty-four children). At the time, Little League did not offer baseball to kids aged 10 and under. West Seattle Pee Wee Baseball was started by two fathers who wanted their young sons to be able to play. Eldon Grayson and Bob Van Antwerp saw the need and started with 4 teams, one from the Alki area, one from Roxbury and the Squirts from Genesee Hill, sponsored by Hires Beverage Distributing. The league rapidly grew to 28 teams (448 children) ages 7-10. At one point, it was the largest association in the United States devoted to Pee Wee Baseball. Early games were played at Alki Playfield, Hiawatha (even the little field), EC Hughes, and Lincoln Park. 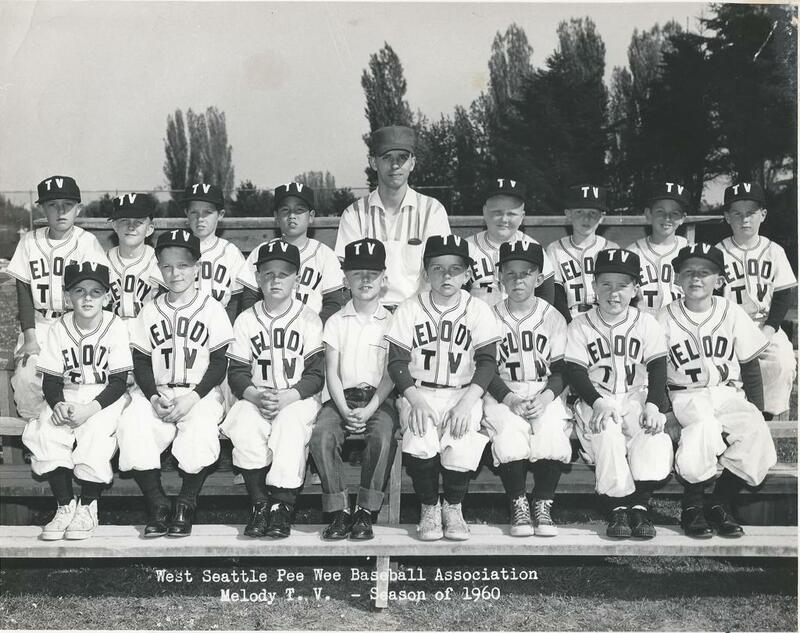 In 1973, the West Seattle Pee Wee Fields were built by parent volunteers. For the first time, all Pee Wee games would be played at one location, the same location that the Shetland, Pinto and Mustang games are played today. The photos to the left are of the Billy Peterson Sportsmanship Award. The award was given to the team that demonstrated the best sportsmanship for the season. It was a true honor to receive this award. Early in the season of 1961 a young boy, Billy Peterson, was turning out for a Pee Wee team practice when he was struck by a car and killed on Delridge Way and SW Thistle. In his memory, Billy's parents presented to the League a trophy to be awarded each year to the team displaying the best sportsmanship during the baseball season. The ballplayers and umpires of the league voted to make this decision. This was one of the most coveted awards in the West Seattle Pee Wee League. The photo above was sent by Joe Fisher. The ball is stamped "West Seattle Pee Wee, 1961". Joe's father Dale helped start West Seattle Pee Wee Baseball. He was involved in writing the original bylaws. He also coached a team sponsored by Roxbury Lanes. The following was taken from a land use agreement signed by Mayor Charles Royer in 1974. Prior to 1973, the city-owned land now known as Lower Riverview Playfield was unimproved due to several factors, among the most important of which was lack of funds for development. In the early 1970's it became apparent that additional baseball facilities were needed in that area. 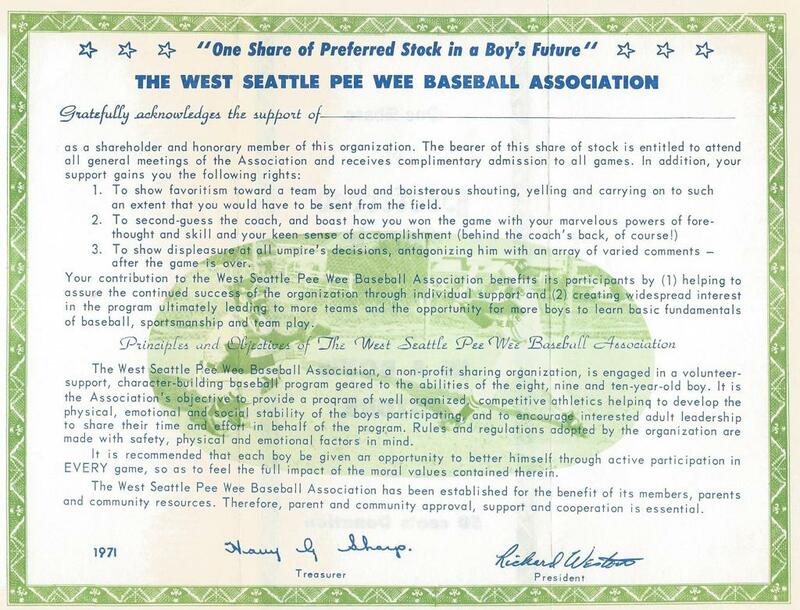 the need arose, at least in part, because of the growth of the West Seattle Pee Wee Baseball Association, Inc. The West Seattle Pee Wee Baseball Association, Inc., is a non-profit organization. It was founded in 1957 and has grown from 4 teams, sixty-four (64) children to 28 teams, four hundred and forty-eight (448) children and is the largest association in the United States devoted to Pee Wee Baseball. Each team has 6 active adults to assist and guide it. The Association serves beginning baseball players in the age ranges from 7 - 10 years old and prepares them for advancement into Little League. In the 1972 and 1973 seasons over five hundred children were cut from the Association teams or otherwise not allowed to play baseball because of lack of available facilities in which to play ball. Community leaders and parents in the Association in cooperation with the City of Seattle Department of Parks and Recreation searched for additional playfield areas. In that search they recognized that regulation size facilities are under an ever increasing pressure for use by adult teams. Because of this, numerous scheduled Association games and practices have been forced to terminate without completing the games because Pee Wee aged children could not complete their games within the time allotted by the schedule and their games were not allowed to extend into other scheduled games. In order to obtain additional baseball facilities, the children and parents of the Association together with other interested persons have raised substantial sums of money since 1965 through carious fund raising drives. In addition to the above, interested persons in the Hiawatha Neighborhood were successful in acquiring additional funds thru the Model Cities Program. By means of the cooperation and assistance of the City of Seattle Department of Parks and Recreation, these funds together with a substantial amount of donated labor and machinery were used to develop the presently existing Lower Riverview Playfield. Recognizing that all other baseball facilities in the area are regulation size; and that no other facilities were scaled for the Pee Wee age group (7-10 years); and that the lower Riverview Playfield would accommodate 4 fields of Pee Wee scale, but would have only accommodated 2 fields at regulation size; the facility was developed by installing 4 Pee Wee scale fields. To show favoritism toward a team by loud and boisterous shouting, yelling and carrying on to such an extent that you would have to be sent from the field. To show displeasure at all umpire's decisions, antagonizing him with an array of carried comments - after the game is over. Sponsorship in West Seattle Baseball/West Seattle Pee Wee Baseball has always been a critical element in funding the league and keeping baseball affordable. What makes it unique at the Pee Wee Fields is that the teams have always carried the sponsors names. Sponsorship have always come from local businesses of West Seattle. Many of the past sponsors are no longer in business today, but they leave a great memory in our hearts. Today, teams are still known by one name, Husky, Alki, Tom's or Menashe to name a few. Without the support of sponsors, who knows where our league would today. In 2012, in an effort to keep baseball affordable in West Seattle, West Seattle Association of Pee Wee Baseball merged with Southwest Seattle Pony Baseball to form West Seattle Baseball. This creates better continuity from ages 5 to 16, with one common Executive Board and one vision. West Seattle Pee Wee consisted of Pony Baseball divisions Shetland, Pinto and Mustang, ages 5-10. Southwest Seattle Pony Baseball had the Bronco, Pony and Colt divisions, ages 11-16. Prior to the merge, for many kids, the Bronco division seemed intimidating. It was their first experience playing away from the comforts of the Pee Wee Fields. There was a draft, standings were kept, and the competition was a little higher. Little did they know that they would fit right in. The merger helped relieve those fears and bring all of the information together on one website. Today the transition seems much easier. Most of the Bronco games have been moved out of Lincoln Park to the Upper Riverview Fields, making it easy for the younger kids to see the older kids in action.